Farhad Hormozdiari, a recent ZarLab alumni, contributed to a paper published this week in Nature. Our paper reports new findings on genetic factors related to human cognition and neurodevelopmental disorders, the result of a collaboration with UCLA’s David Geffen School of Medicine and the School of Biotechnology and Biomolecular Sciences at University of New South Wales. Farhad implemented the software package CAVIAR which was utilized to identify the causal variants and interpretation of data. Neurodevelopmental disorders such as autism and schizophrenia are thought to originate during embryonic development of the cerebral cortex. The project focused on the 3D interactions of genome-wide chromatin contacts, the areas of a cell’s nucleus that package chromosomes into DNA and influence cell replication. Chromatin contacts regulate gene expression in specific tissues, and mapping their interactions within chromosomes provides important biological insights into the malfunctioning gene regulatory mechanisms that drive these disorders. The project generated high-resolution 3D maps of chromatin contacts active during development of the cortex region of the human brain. These maps enabled a large-scale annotation of previously uncharacterized regulatory mechanisms tied to the evolution of human cognition and disease. Using this data, the paper identified hundreds of genes involved with human cognitive function. Next, the paper integrated chromatin contacts with noncoding variants previously identified in schizophrenia genome-wide association studies (GWAS) and performed several analyses to explore the relationships of interactions between chromatin and biological function. One of the uses of CAVIAR in the paper was to verify that the causal variants involved in schizophrenia GWAS are in fact compatible with the 3D maps of chromatin contacts. The paper also found several highly interacting chromatin regions that correlate with levels of gene expression and are associated with promoters, positive transcriptional regulators, and enhances—areas of the genome that shape cell replication and neurological development. The paper identified specific sets of genes enriched in known intellectual disability risk genes, including mutations known to cause autosomal recessive primary microcephaly. The GWAS results identified approximately 500 genome-wide significant schizophrenia-associated loci, about 30% of which interact with schizophrenia SNPs exclusively in developing brain tissue. Genome editing in human neural progenitors suggests that one of these distal schizophrenia GWAS loci regulates FOXG1 expression, supporting its potential role as a schizophrenia risk gene. In: Nature, 538 (7626), pp. 523-527, 2016, ISSN: 1476-4687. Annotation of schizophrenia-associated loci identified by a GWAS of chromatin contact data. Although genome-wide association studies (GWAS) have identified thousands of variants associated with common diseases and complex traits, only a handful of these variants are validated to be causal. We consider ‘causal variants’ as variants which are responsible for the association signal at a locus. As opposed to association studies that benefit from linkage disequilibrium (LD), the main challenge in identifying causal variants at associated loci lies in distinguishing among the many closely correlated variants due to LD. This is particularly important for model organisms such as inbred mice, where LD extends much further than in human populations, resulting in large stretches of the genome with significantly associated variants. Furthermore, these model organisms are highly structured and require correction for population structure to remove potential spurious associations. 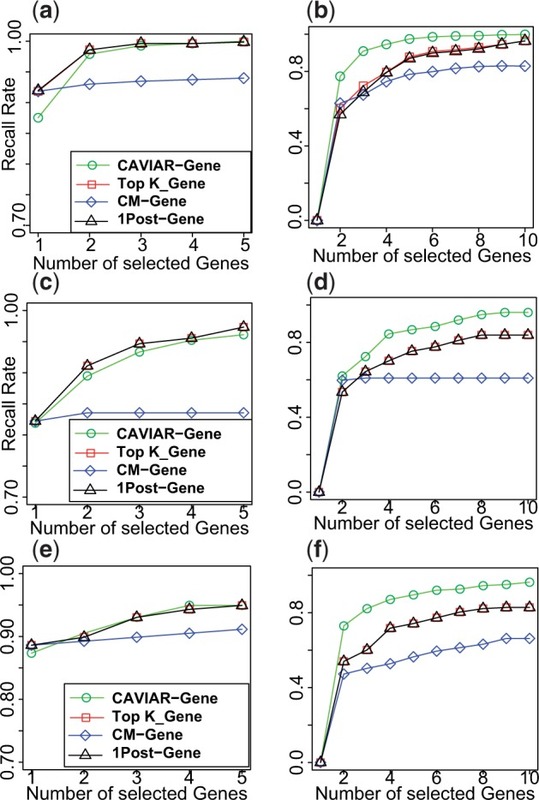 In our recently published work, we propose CAVIAR-Gene (CAusal Variants Identification in Associated Regions), a novel method that is able to operate across large LD regions of the genome while also correcting for population structure. A key feature of our approach is that it provides as output a minimally sized set of genes that captures the genes which harbor causal variants with probability q. Through extensive simulations, we demonstrate that our method not only speeds up computation, but also have an average of 10% higher recall rate compared with the existing approaches. We validate our method using a real mouse high-density lipoprotein data (HDL) and show that CAVIAR-Gene is able to identify Apoa2 (a gene known to harbor causal variants for HDL), while reducing the number of genes that need to be tested for functionality by a factor of 2. In the context of association studies, the genetic variants which are responsible for the association signal at a locus are referred to in the genetics literature as the ‘causal variants.’ Causal variants have biological effect on the phenotype. 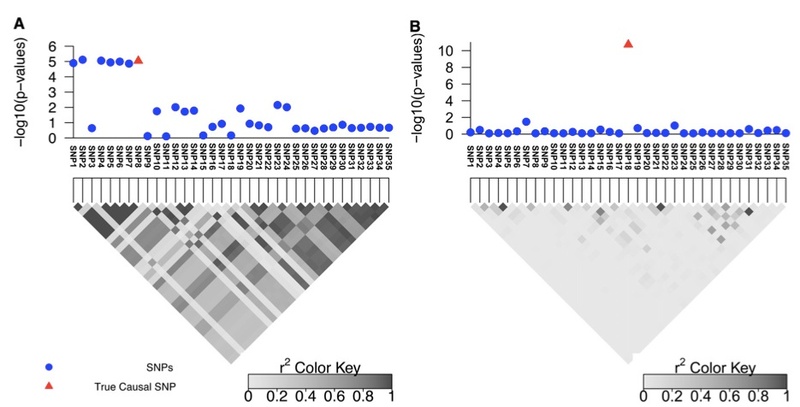 CAVIAR-Gene provides better ranking of the causal genes for Outbred, F2, and HMDP datasets. Panels a and b illustrate the results for Outbred genotypes for case where we have one causal and two causal genes, respectively. Panels c and d illustrate the results for F2 genotypes for case where we have one causal and two causal genes, respectively. Panels e and f illustrate the results for Outbred genotypes for case where we have one causal and two causal genes, respectively. Generally, variants can be categorized into three main groups. The first group is the causal variants which have a biological effect on the phenotype and are responsible for the association signal. The second group is the variants which are statistically associated with the phenotype due to LD with a causal variant. Even though association tests for these variants may be statistically significant, under our definition, they are not causal variants. The third group is the variants which are not statistically associated with the phenotype and are not causal. CAVIAR-Gene is a statistical method for fine mapping that addresses two main limitations of existing methods. First, as opposed to existing approaches that focus on individual variants, we propose to search only over the space of gene combinations that explain the statistical association signal, and thus drastically reduce runtime. Second, CAVIAR-Gene extends existing framework for fine mapping to account for population structure. The output of our approach is a minimal set of genes that will contain the true casual gene at a pre-specified significance level. The output of our approach is a minimal set of genes that will contain the true casual gene at a pre-specified significance level. This gene set together with its individual gene probability of causality provides a natural way of prioritizing genes for functional testing (e.g. knockout strategies) in model organisms. Through extensive simulations, we demonstrate that CAVIAR-Gene is superior to existing methodologies, requiring the smallest set of genes to follow-up in order to capture the true causal gene(s). Building off our previous work with CAVIAR, CAVIAR-Gene takes as input the marginal statistics for each variant at a locus, an LD matrix consisting of pairwise Pearson correlations computed between the genotypes of a pair of genetic variants, a partitioning of the set of variants in a locus into genes, and the kinship matrix which indicates the genetic similarity between each pair of individuals. Marginal statistics are computed using methods that correct for population structure. We consider a variant to be causal when the variant is responsible for the association signal at a locus and aim to discriminate these variants from ones that are correlated due to LD. infeasible. Instead of producing a rho causal set of SNPs, CAVIAR-gene detects a ‘q causal gene set’ which is a set of genes in the locus that will contain the actual causal genes with probability of at least q. In: Bioinformatics, 31 (12), pp. i206-i213, 2015, ISSN: 1367-4811. Figure 1 (A and B) Simulated data for two regions with different LD patterns that contain 35 SNPs. A and B are obtained by considering the 100 kbp upstream and downstream of rs10962894 and rs4740698, respectively, from the Wellcome Trust Case–Control Consortium study for coronary artery disease (CAD). Our group in collaboration with our UCLA colleague Bogdan Pasaniuc’s group recently published two papers focusing on “statistical fine mapping”. We published a paper on a method called CAVIAR in the journal Genetics and Bogdan’s lab published a method called PAINTOR in PLoS Genetics. The software is available at http://genetics.cs.ucla.edu/caviar/ and http://bogdan.bioinformatics.ucla.edu/software/PAINTOR/. Although genome-wide association studies have successfully identified thousands of regions of the genome which contain genetic variation involved in disease, only a handful of the biologically causal variants, responsible for these associations, have been successfully identified. Because of the correlation structure of genetic variants, in each region, there are many variants that are associated with disease. The process of predicting which subset of the genetic variants are actually responsible for the association is referred to as statistical mapping. Current statistical methods for identifying causal variants at risk loci either use the strength of association signal in an iterative conditioning framework, or estimate probabilities for variants to be causal. A main drawback of existing methods is that they rely on the simplifying assumption of a single causal variant at each risk locus which is typically invalid at many risk loci. In our papers, we propose a new statistical framework that allows for the possibility of an arbitrary number of causal variants when estimating the posterior probability of a variant being causal. A direct benefit of our approach is that we predict a set of variants for each locus that under reasonable assumptions will contain all of the true causal variants with a high confidence level (e.g. 95%) even when the locus contains multiple causal variants. We use simulations to show that our approach provides 20-50% improvement in our ability to identify the causal variants compared to the existing methods at loci harboring multiple causal variants. Figure 2 Simulated association with two causal SNPs. (A) The 100-kbp region around the rs10962894 SNP and simulated statistics at each SNP generated assuming two SNPs are causal. In this example SNP25 and SNP29 are considered as the causal SNPs. However, the most significant SNP is the SNP27. (B) The causal set selected by CAVIAR (our method) and the top k SNPs method. We ranked the selected SNPs based on the association statistics. 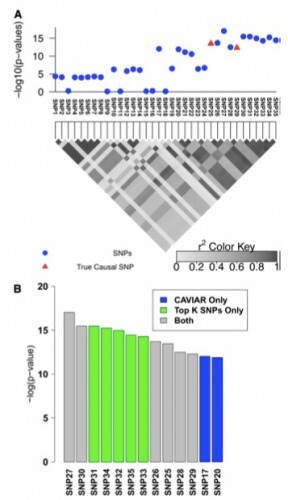 The gray bars indicate the selected SNPs by both methods, the green bars indicate the selected SNPs by the top k SNPs method only, and the blue bars indicate the selected SNPs by CAVIAR only. The CAVIAR set consists of SNP17, SNP20, SNP21, SNP25, SNP26, SNP28, and SNP29. For the top k SNPs method to capture the two causal SNPs we have to set k to 11, as one of the causal SNPs is ranked 11th based on its significant score. Unfortunately, knowing the value of k beforehand is not possible. Even if the value of k is known, the causal set selected by our method excludes SNP30–SNP35 from the follow-up studies and reduces the cost of follow-up studies by 30% compared to the top k method. Our approach, CAVIAR, takes as input the association statistics for all of the SNPs (variants) at the locus together with the correlation structure between the variants obtained from a reference data set such as the HapMap (Gibbs et al. 2003; Frazer et al. 2007) or 1000 Genomes project (Abecasis et al. 2010) data. Using this information, our method predicts a subset of the variants that has the property that all the causal SNPs are contained in this set with the probability r (we term this set the “r causal set”). In practice we set r to values close to 100%, typically $95%, and let CAVIAR find the set with the fewest number of SNPs that contains the causal SNPs with probability at least r. The causal set can be viewed as a confidence interval. We use the causal set in the follow-up studies by validating only the SNPs that are present in the set. While in this article we discuss SNPs for simplicity, our approach can be applied to any type of genetic variants, including structural variants. We used simulations to show the effect of LD on the resolution of fine mapping. We selected two risk loci (with large and small LD) to showcase the effect of LD on fine mapping (see Figure 1, A and B). The first region is obtained by considering 100 kbp upstream and downstream of the rs10962894 SNP from the coronary artery disease (CAD) case–control study. As shown in the Figure 1A, the correlation between the significant SNP and the neighboring SNPs is high. We simulated GWAS statistics for this region by taking advantage that the statistics follow a multivariate normal dis- tribution, as shown in Han et al. (2009) and Zaitlen et al. (2010) (see Materials and Methods). CAVIAR selects the true causal SNP, which is SNP8, together with six additional variants (Figure 1A). Thus, when following up this locus, we have only to consider these SNPs to identify the true causal SNPs. The second region showcases loci with lower LD (see Figure 1B). In this region only the true causal SNP is selected by CAVIAR (SNP18). As expected, the size of the r causal set is a function of the LD pattern in the locus and the value of r, with higher values of r resulting in larger sets (see Table S1 and Table S2). We also showcase the scenario of multiple causal variants (see Figure 2). We simulated data as before and considered SNP25 and SNP29 as the causal SNPs. Interestingly, the most significant SNP (SNP27, see Figure 2) tags the true causal variants but it is not itself causal, making the selection based on strength of association alone under the assumption of a single causal or iterative conditioning highly suboptimal. To capture both causal SNPs at least 11 SNPs must be selected in ranking based on P-values or probabilities estimated under a single causal variant assumption. As opposed to existing approaches, CAVIAR selects both SNPs in the 95% causal set together with five additional variants. The gain in accuracy of our approach comes from accurately disregarding SNP30–SNP35 from consideration since their effects can be captured by other SNPs. PAINTOR extended the CAVIAR model to also take into account the function of the genetic variation. In: Genetics, 198 (2), pp. 497-508, 2014, ISSN: 1943-2631. In: PLoS Genet, 10 (10), pp. e1004722, 2014, ISSN: 1553-7404.